Dont forget it is going to be our Easter Bonnet parade tomorrow (Wednesday 3rd April) even if the weather is wet we will hopefully go ahead and still do it in the Pre -School, but please keep your fingers crossed for nice bright weather. We will be selling cakes etc and raffle tickets on the gate from 11:30am so please bring some change along. We will be drawing the Easter raffle at the end of the parade. All children who attend will recieve an Easter egg from the Pre -School. We cant wait to see your creations. Next Wednesday (3rd April 2019) is our Easter bonnet parade the children are all invited back to the Pre -School from 12pm to come and parade their hat, they will then recieve their Easter gift from the Pre -School. Morning children will need to be collected as normal so we can set the rooms up ready for all the children to come back in. We look forward to celebrating Easter with you all. 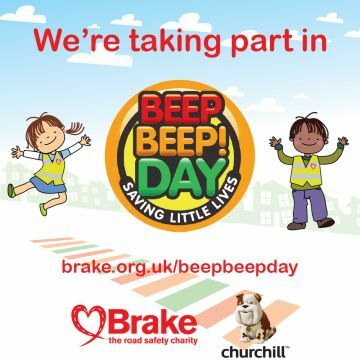 Today we celebrated Beep Beep day and looked at how to stay safe on the roads and when walking to school. The children talked about holding hands and we learnt a new song to the tune of the wheels on the bus about knowing how to stay safe. Each child that took part in beep beep day at the Pre-School recieved a sticker , certificate and colouring cards to post up at home to remind them how to say safe.